I finally finished the sewing project I mentioned here a couple weeks ago! 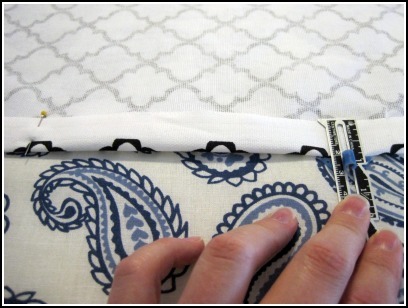 If you ‘like’ The Junk House on facebook then you already know that I was sewing curtains. I bitched mentioned on there that they were taking forever. But they are finally done and look awesome, if I do say so myself. I think the hardest part was finding enough fabric to make 4 panels. I needed 2 ½ yards to make one panel. The first (and closest) Hobby Lobby had enough fabric for 3 of the panels (and 30%-off). The second Hobby Lobby didn’t have any of the fabric I needed. Finally, the third Hobby Lobby (hour round-trip drive) had enough fabric (not 30%-off) for the last panel. Yay! 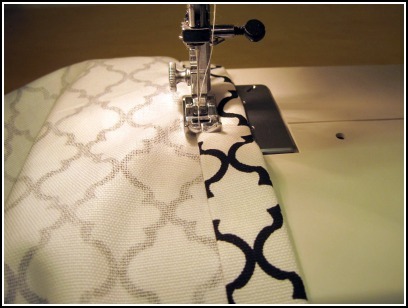 Let’s get our sew on! First step, measure and pin! I measured up the side with my handy-dandy tool and pinned/ironed. Once both sides were finished I measured a 2 ½ inch pocket for the rod, pinned/ironed, and sewed. Anyway, I hung the panel and pinned the perfect length. I sewed up the bottom and BAM! one panel down! Finally, I hung all of the panels and did a little victory dance! Love! Love! Love! They changed the whole look of the room and hide the ugly wood blinds. Now I just need some furniture for the sitting nook I’m planning right there! Thank you for the tutorial. 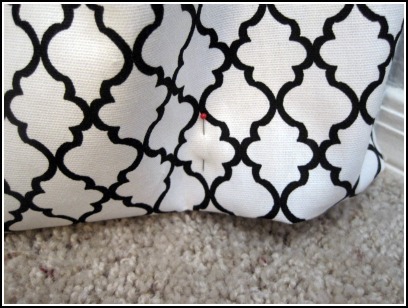 I have tried to sew curtains many times but always fail dramatically. I LOVE this material! I made a nursing cover out of the blue one of it. 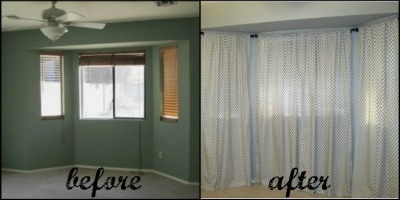 Your curtains look awesome! What a difference it makes! I ADORE that fabric! You should be an interior designer. I always love what you come up with! Good job on the cutains! I'll be making more curtains in the next couple of weeks. Hate doing it, but I can't find any pre-made that I like. Oh well. Found you via Fabulously Flawed and have become your newest follower. Pop on over for a visit when you get a moment. 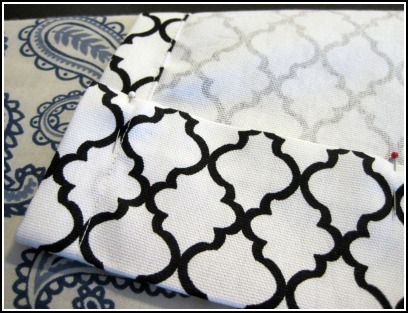 I <3 the Moroccan pattern! 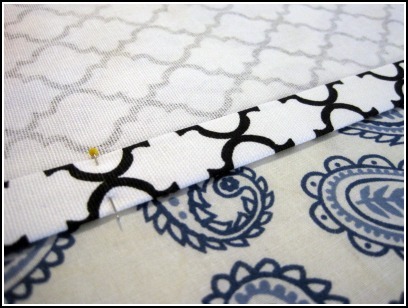 I think that it is such a classic and timeless pattern, yet still maintains an easy level of simplicity. 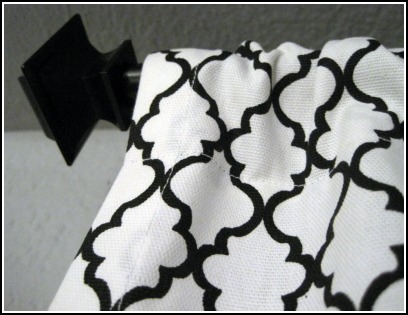 I have it on the back of a bookshelf but never thought of doing curtains! I may steal the idea for my master bathroom window! Thanks for the ideas! I like it! I found you on C.R.A.F.T., and I just LOVE what you did. 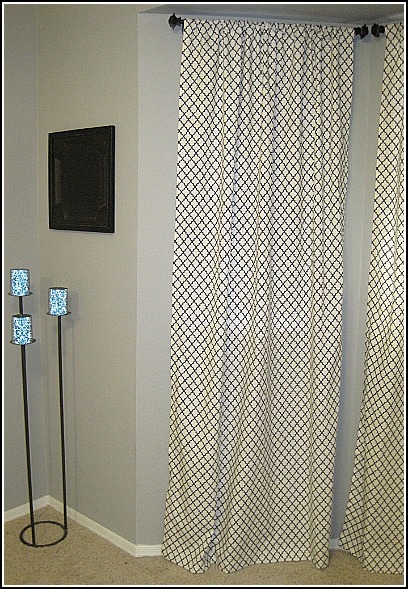 I LOVE Hobby Lobby, but if I would have seen this fabric, I would have saved a lot on my new bathroom curtains! I LOVE that fabric and I LOVE Hobby Lobby. I miss it very much! Thanks so much for sharing over at born-again crafter! THey look great - -I adore that fabric! Beautiful fabric! Love how they turned out! Great job! Thanks for linking up with us at Show and Share! Beautiful fabric. I love the pattern and what it does for the room. Very nice. LOVE the curtains Sam! I think they're awesome! I wish I knew how to sew! 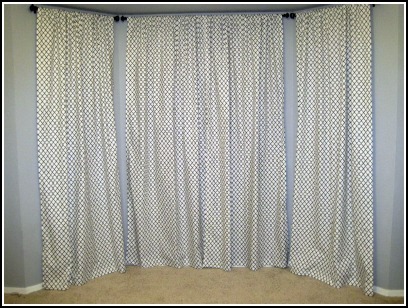 I made some curtains tonight, hehe, kind of anyway. I made them to go in my son's room. Thanks for stopping by the other day, I can't wait to show off his new room soon. 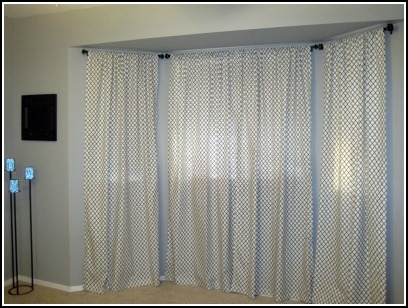 love these curtains! Great job!